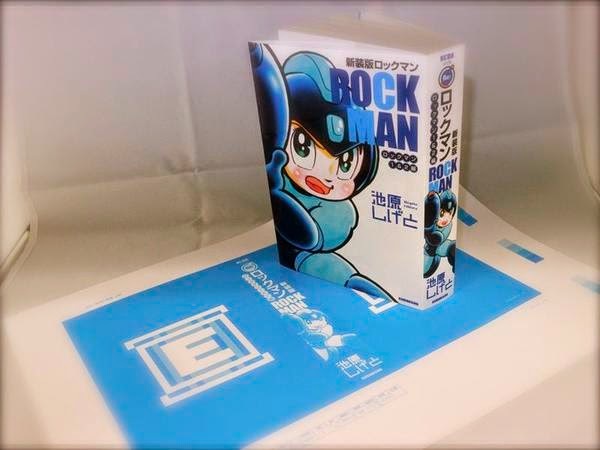 Re:BomBom has the first look at Shigeto Ikehara's Rockman 1&2 manga compilation. As you've no doubt surmised, it's huge. The reprint will chronicle Ikehara's adaptations of the first two Rockman games, which originally ran in Comic Bom Bom from 1992 to 1994. The book will release on December 22nd for 1,598 Yen (roughly $14.66 US). Here's hoping this will be a future prospect for UDON to grab! From the angle of view, and the way the light is hitting that book, it does make the artwork look super classic. Mega Man's design seems to work really well with the artstyle, I'll give it that much. It's better looking to me than that generic Pokemon looking Hitoshi Ariga bull crap, at least anyway. I dunno if we'd see this over here, I recall udon had reservations about the X mangas due to not only less popularity and increased price due to bigger volumes, but the art being "very retro"
Do want very muchly, just hope someone like Udon can get them translated! I really hope they import this. As an American, I still have yet to read a Megaman comic/Rockman manga that has both high-quality art AND professional writing. I'm not saying Megamix/Gigamix had bad art, the style and composition just don't suit the comic format very well. I have the original printing of these. Trust me when I say after you read them, you'll still be in the same position you are now. The art is OK if you don't mind Rock looking like Astro Boy, but the writing and plot is terrible. They stick so close to the games that in parts they almost read like guides. When the manga was translated to Malay Language here,it cost only RM4.90 which is like $1=RM3.50.I feel sad for people to pay that much. U.S currency is losing its value.